A sad thing has happened in my life lately. I've had to stop eating Gluten. Now, I know everyone thinks this is a fake thing, but all I know is that I feel much better since I stopped eating it. When I told one of my friends about this new development, her comment was that at least it's trendy right now. So, whether you believe in people being gluten free or not, you have to admit a lot of people are cutting out gluten products nowadays. 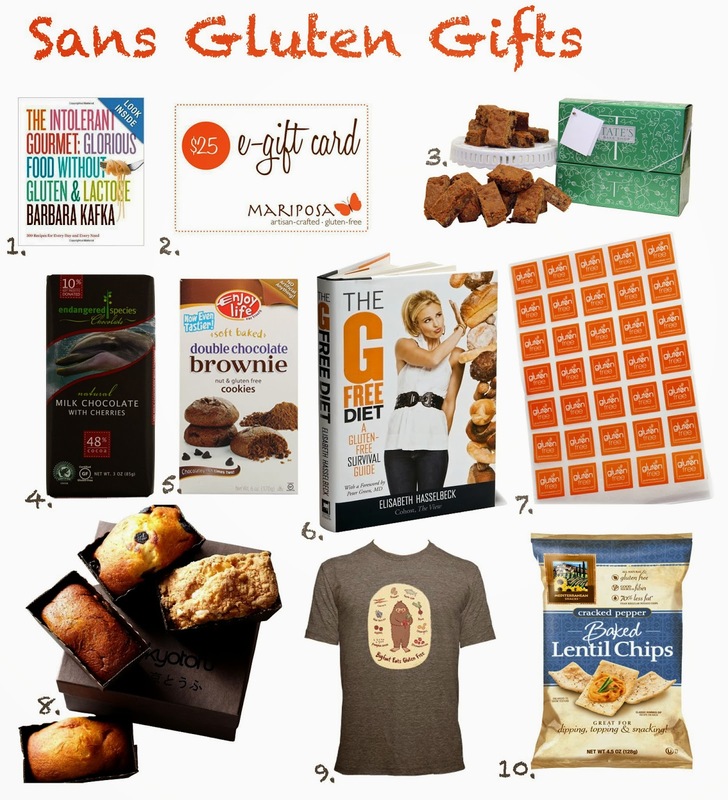 So, today's gift guide is for your friends who don't eat the wheat. Let's get this party started! I dont' cook that much, so I haven't really researched Gluten-Free cookbooks, but this one was recommended by the Today Show, and I feel like the usually know their stuff. 2. Mariposa E-Gift Card: Mariposa, Prices Vary. So your Gluten-challenged friend can have a little treat even after christmas. I love Tate's cookies, so I'm guessing these are also delicious. Plus, they come in that lovely little box. 4. Endangered Species Milk Chocolate with Cherries, Amazon, $33.48 for a pack of 12. This chocolate is delicious. I especially like how it's got the chewy cherries in it. If you don't' need to order a whole dozen, you can also find this chocolate at Whole Foods. I picked up a box of these the other day at Publix, and I had finished the box before the next day. Admittedly, they're not as delicious as glutenous brownies, but they will certainly do in a pinch. Whether you love Elizabeth Hasselbeck or hate her, she does have Celiac Disease, and the girl in my office who is helping me along my Gluten-Free way said this book taught her everything she knows. Get it, Elizabeth! This is a great gift for anyone who goes to a lot of pot lucks or shares a kitchen with someone else. I just like cake. That's why this is on the list. I tried to look for normal-looking gluten-free tee shirts, but none of them seemed to capture my personal shame and apologetic feelings for being on such a weird, annoying diet. So instead of opting for a "proud to be gluten free" tee, I thought I'd go for something that at least had cute artwork. And here it is! I used to eat these chips even before I went gluten free. They're just plain good. And, if you're not into ordering your chips online, you can always pick up a bag at whole foods. They're delicious. However, be forewarned: They are full of fiber.